During the first-half of 2017 the U.S. experienced the highest number of catastrophe events since 1980, which resulted in the highest insured loss total for the period since 2011, according to the PCS H1 2017 Catastrophe Review. PCS designated 29 U.S. catastrophe events in the first-six months of this year, which is the highest recorded since 30 events in H1 1980, and is 24% above the ten-year (2008-2017) frequency average of 22 events. 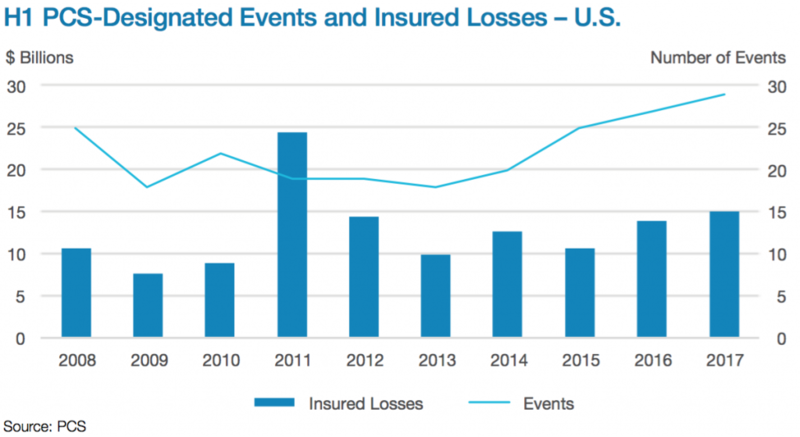 Combined, the events resulted in an insurance industry of just over $15 billion, which is the highest U.S. catastrophe loss total for the opening six months of a year since 2011, which had $24 billion in insured losses. Furthermore, the $15 billion is above the ten-year (2008-2017) average by 16% and, four of the 29 events had insured losses of more than $1 billion, while just three had losses insured losses of less than $100 million. “The first half of this year has shown a continuation of a trend going back to 2013 for first-half cat activity. First-half frequency has increased each year during this period – going from 18 events in the first half of 2013 to 29 this year. Further, hail remains a challenge. Storms causing significant hail losses occurred in both the United States and Canada. Again, this appears to be a trend over the past several years,” said Ted Gregory, Director, PCS. 36 states across the U.S. were impacted by catastrophe events in the first-half of 2017, which is a slight reduction on the 39 recorded in H1 2016, but significantly above the 27 recorded in 2015 and the 24 in 2014. Unsurprisingly, Texas remains the hardest-hit state in the U.S., with 15 events in H1 2017 (14 H1 2016) driving insured losses of $3.4 billion. 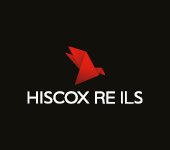 While still high and above the $2.4 billion witnessed in 2015, H1 2017’s figure for Texas is less than half the total the region incurred in H1 2016. In terms of insured losses, Colorado followed Texas at $1.6 billion, which was a result of two events. Next came Minnesota, at $1.1 billion from four events. No other state incurred insured losses of more than $800 million in the period, but Illinois did experience eight catastrophe events, while Missouri, Georgia, and Tennessee recorded seven PCS Designated events in the first-half of 2017. Johansmeyer told Artemis that generally speaking, catastrophe activity in the first of the year sets the tone for how the entire year will end up. “Most second-half catastrophe events are smaller, and they usually don’t push the year’s total up too much. This is particularly evident in 2013 and 2014. With that in mind, 2015 and 2016 stand out, mostly because of larger events that include hail later in the year. This is something we’ve seen happening lately, and it can have a somewhat unexpected impact on some programs. “Now, I’m pretty sure most eyes are going right to 2012. And this is the exception that the industry tends to keep in mind. A major hurricane in the third or fourth quarter can certainly change the year – as Sandy did. However, absent a major tropical storm – or earthquake, for that matter – the second half of the year tends to be quieter than the first half,” explained Johansmeyer. The above chart, provided by PCS, shows how the volume of insured catastrophe losses in the second-half of each of the last four years has been below $8 billion, with the average being just under $5 billion. However, in 2012 this spiked to more than $20 billion, underlining how a major event can drastically change the landscape. $8, or 53.3% of H1 2017 U.S. catastrophe losses occurred in the second-quarter of the year, and PCS explains that with resurveys required on 14 events it expects the Q2 total remain consistent with the ten-year average of $9.2 billion, meaning the $15 billion H1 2017 total could increase further still. 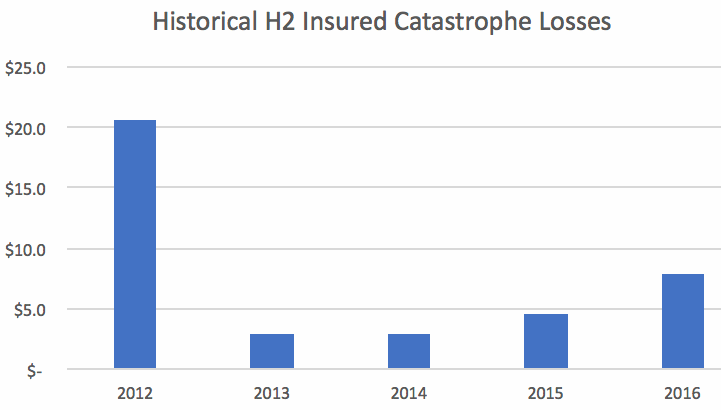 Over the last decade, only twice (2011 and 2012) has second-quarter insured catastrophe losses surpassed $10 billion, although this did nearly happen in 2014, and there’s a possibility this could happen this year after the 14 resurveys have been completed. PCS also reports on first-half catastrophe activity in Canada, which, in 2017, saw insured losses dip substantially to C$438 million from five events, from C$4.2 billion from six events in H1 2016. However, last year’s total included the Fort McMurray wildfire event, the costliest single catastrophe event recorded in the country, at almost C$4 billion. Since PCS Canada launched, the average H1 insured loss total is C$1.2 billion, which has been increased as a result of the wildfire, and which is 173% higher than that seen in H1 2017. PCS notes that it did not designate any catastrophe events in Turkey in H1 2017. However, Artemis discussed recently that PCS has designated two recent Turkish hail storm and flooding events as catastrophes, which will surely be included in H2 figures for the region.